Depiction of Cain establishing the city of Enoch, by Julius Schnorr von Carolsfeld. According to the Book of Genesis, Enoch (/ˈiːnək/; Hebrew: חֲנוֹך‎; Ḥanōḵ) was a son of Cain, and father of Irad. 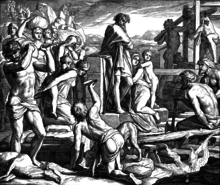 After Cain arrived in the Land of Nod, to which he was evicted by the Lord as his punishment for murdering his brother Abel, his wife became pregnant and bore Cain's first child, whom he named Enoch. This Enoch is not to be confused with Enoch, son of Jared, to whom the authorship of the Book of Enoch is ascribed. After the birth of Enoch, the Hebrew text of Genesis 4:17 is unclear. Either Cain built a city and named it after Enoch, or else Enoch built a city. According to Jubilees 4:9, Enoch's mother/aunt was named Awan. According to a Samaritan tradition, Enoch was buried in Mount Ebal. ^ John Byron (14 February 2011). Cain and Abel in Text and Tradition: Jewish and Christian Interpretations of the First Sibling Rivalry. BRILL. p. 124. ISBN 90-04-19252-2. This page was last edited on 9 July 2018, at 16:12 (UTC).